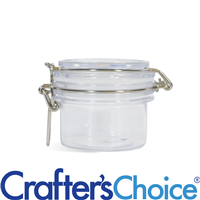 This large plastic bail jar can hold up to 16 ounces of your handmade bath salts, bath teas, laundry detergent and bath fizzies! 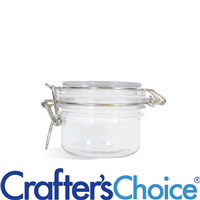 You can also use bail jars to display product and raw material in stores and at craft shows! Total width with hinge and clasp: 4.875"
Container Size (oz. ): 16 Diameter: 3.5"
COMMENTS: I ordered these in bulk I loved them so much! This container provides a wonderfully professional look to my bath salts. Buy them! "How much does each jar weigh? Thank you!" 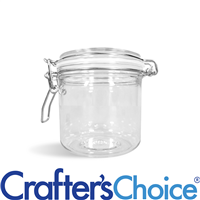 Staff Answer This jar and lid set weighs 5.80 ounces. "What are the dimensions of this jar-height, width diameter"
Staff Answer Height is 4 3/8", Diameter is 3 3/8", Circumference is 11".